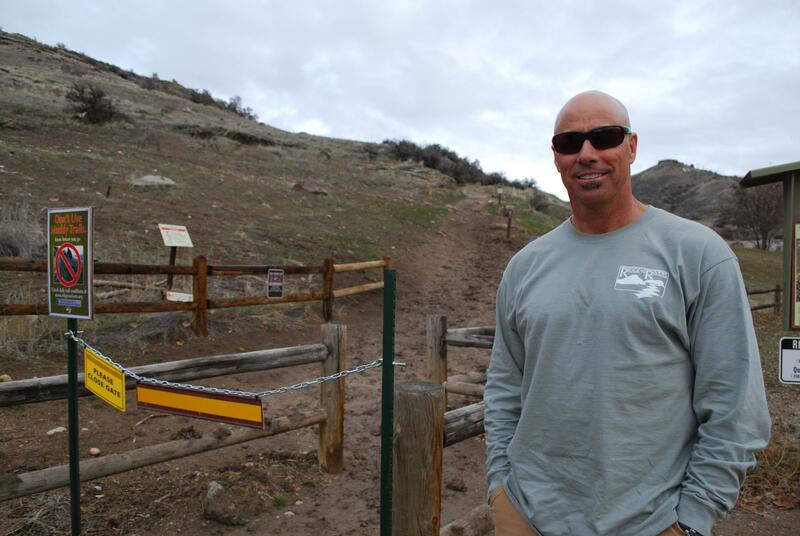 David Gordon manages 150 miles of trails for the City of Boise. "With the rain and rapid melt off of all the snow, everything in the foothills is under at least two or three inches of mud, if not four," Irwin says." It’s awful up there." Irwin and her dogs usually hike four or five miles on the trails. She says using a couple miles of the Greenbelt is an alternative - but not necessarily a good one. Iwrin is one of 400,000 people who hike the Boise foothills every year, according to David Gordon. He manages 150 miles of trails for the City of Boise. Gordon says when it’s muddy, only about 15 percent of trails are usable. He’s fed up with the muddy trails – and the people who continue to use them. Gordon says problems occur when people try to avoid the mud by hiking on the sides. In doing so, they trample and kill vegetation, thus widening trails. When hikers stay on the trails, Gordon says it causes erosion. "I think many of them don’t think they’re doing anything wrong, but they are," he says. They’re the ones that are going to the side of the trail. They’re the ones leaving these deep tracks." Gordon points to the Old Penitentiary trail as an example. When he started his work 12 years ago, he says the path was four-feet wide. Today, it’s twice that. Other trails have suffered similar damage. Gordon has put up signs at trailheads to discourage hikers from using trails when they're muddy. But he says things haven’t gotten better. This year, he put up a gate at one trailhead. Hikers, he says, just go around it. But closing trails - even in the name of protection - isn't an option. Gordon says there are so many access points that to effectively close them all would be too much for his staff of three employees. And once the damage is done, Gordon says it’s taxpayers foot the bills for repairs. Gordon says trails used to be muddy for just a few weeks in March, but in the last few years, they’ve thawed earlier. That means more damage while paths are muddier, longer. He says that sandy trails like Lower Hulls Gulch and Camel’s Back are less susceptible to damage, and encourages hikers to use those when the other trails are muddy. "When you do this for a living and you see your work ruined, and to see our tax dollars being wasted, it’s hard to be super positive and super friendly when you know these people knowingly walked right by these signs that say don’t use them if they’re muddy, and they’re slipping and sliding up the trail," he says. The trailhead for Polecat Gulch Reserve in Boise's foothills will get a new trailhead. And the city wants your thoughts on how that trailhead should look. Kelly Burrows is a park development coordinator. He's designed three different ideas for the trailhead. Burrows says he likes the idea that builds the trailhead right off the cul de sac on Boise's North Collister Drive. The Owyhee Canyonlands cover more than 5 million acres of rugged landscape in southern Idaho and eastern Oregon. Few hikers and campers venture into this desert wilderness because there aren't many trail signs or information. Steve Stuebner teamed up with photographer Mark Lisk to create a guidebook for the Canyonlands. Their new book, The Owyhee Canyonlands: An Outdoor Adventure Guide, details 55 hiking and biking trails.